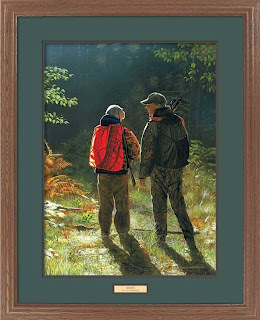 The new print, Lessons, has been posted on Wild Wings website and is officially available! Here is the link for their new releases - Wild Wings. Well, I think I lived up to a typical artistic stereotype this past week. 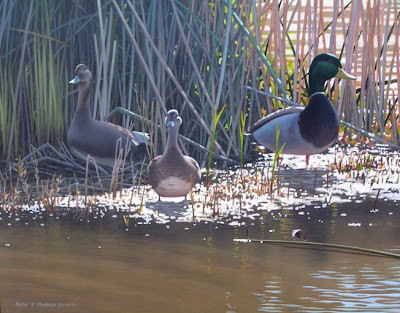 A deadline of Friday afternoon was rapidly approaching to get this mallard painting finished for the Oregon Ducks Unlimited "Artist of the Year" competition. The phone rang at 4:00pm while I was still frantically painting and not even close to completion. I knew it was the contest coordinator saying they needed the painting. I pleaded on the phone that the painting was unfinished, but it was to a point where they would at least be able to see what the painting will look like (especially if they stand back about 10 feet). He graciously said that was fine and they would accept the painting into the contest. So, off it went to the DU state convention in Newport, OR and the ducks have no eyes, the reflections in the water are not completed, nor is much feather detail or any real detail for that matter. Dang Artists!! I had the oppurtunity to be interviewed this morning by the guys from The Morning Show on AM1220 KPJC. We discussed life, faith, and art. 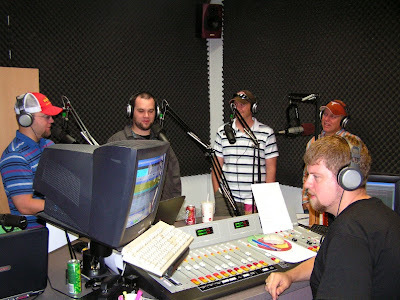 Pictured from left are Anthony, Bo, myself, Karl, and Ryan running the board. To the left of Anthony and, unfortunately not pictured, are Nathan and Phil. These guys are hilarious and really made the interview fun. Thanks for a great time! Tommorrow morning I will be interviewed on local radio station KPJC 1220am in Salem, OR. The interview will be a part of The Morning Show from 7-9am. If you are interested you can listen to the show via the internet at http://www.thejctown.com/ by clicking the link "Listen Live". Hopefully, you can tune in. This isn't an art related entry but I recently had an experience worth writing about. I was asked by a friend of mine to participate as a "bad guy" in a S.W.A.T. (Special Weapons and Tactics) team training exercise. All in all, there were two bad guys and 4 victims/hostages against the team as we ran through a variety of scenarios in an abandoned two story office building here in my hometown. What really made this interesting and fun was that we were armed with Airsoft guns. These guns shoot actual plastic bb's that will cause a welt when making contact with bare skin. While I had a spring loaded handgun the SWAT team had what looked to be semi-automatic pistols with lights on them and fully automatic machine guns. In the fist scenario, I had two victims with me downstairs in the back of the office and the other bad guy had two victims with him upstairs. The lights were off, and watching the S.W.A.T. team methodically and purposefully work their way down the hallway looking for me, was a bit unnerving. I had the freedom to react any way I chose - and I chose to jump out and shoot. What a bad move! I was immediately answered with what seemed like hundreds of bbs ricocheting all around the wall indentation that I ducked back into. The only thing I had a chance to see were numerous flashlights (which are built in to their guns) taking positions. Feeling brave and determined to continue the fight, I poked my head out and fired another shot so I could get a better bearing on where they were. I was met with a barrage of gunfire including a couple right to my face mask. Instant Death. Scenario over. After each scenario was "cleared", the team met to evaluate their procedures. All told we went through 5 or 6 situations including a botched bank robbery and a drug house raid. Some were gunfights and others weren't. I know this for sure - who ever would want to challenge a S.W.A.T. team has to be certifiably insane. They are professional, quick, relentless, armed, protected and experienced. They can be stealthy and they can be forceful depending on what the situation presents. All in all it was an incredible experience and I only got a few welts. Here is an update of a painting in progress that was posted earlier. 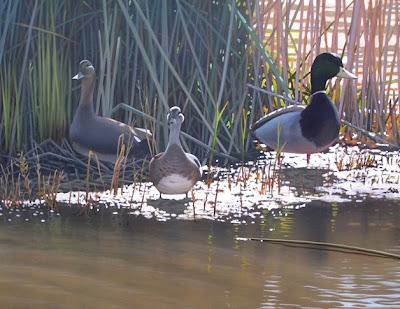 There is still no title as of yet, but it's of a pair of gadwall and a mallard and is closer to completion. The only thing really left is some of the finer details, so, hopefully, it should be finished within the week. Recently, I have been going back and forth between this painting and a couple of commissioned pieces. 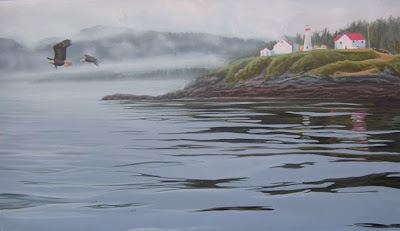 This is a painting of a lighthouse on the northern Queen Charlotte Strait near Port Hardy has been in progress for close to a year. Bald Eagles are so numerous in these waters that they seemingly outnumber the gulls. These two eagles are heading out to a feed on a school of bait fish. When these schools are near the surface the eagles seem to spot them and fly to feed from miles away - it's incredible! I am feeling inspired to continue on this painting again after the long layoff. I haven't even looked at it for several months, which gives me fresh eyes to attack the painting again. A big reason for the inspiration is the fact that I am soon heading back up to this area to try and catch some big halibut and some big kings. These two paintings have been recently selected for the Wild Wings Fall Festival which occurs October 5-7 in the Historic Ballroom at City Hall in downtown Lake City, Minnesota. 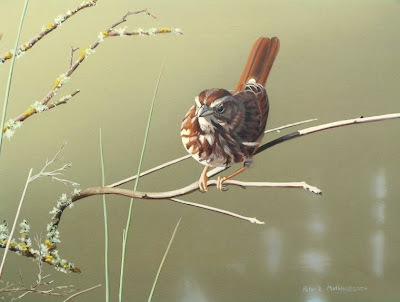 The Fall Festival brings together Wild Wings' artists that showcase over 100 original paintings, sculptures and carvings. 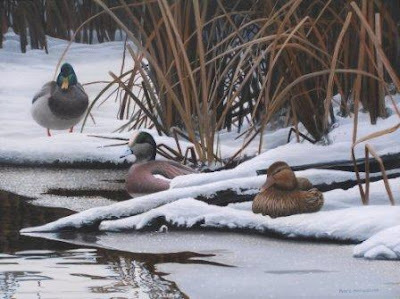 The above painting - Greenwing Reflections - will be featured in the upcoming Originals Catalog that is published annually. 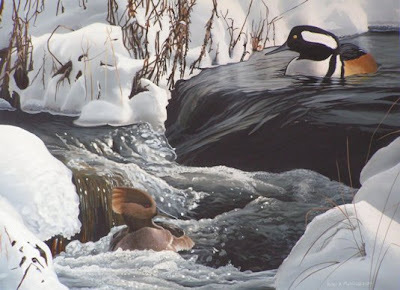 Icy Ride -Hooded Mergansers will also be included in the show. There will possibly be one more painting in the show as well. Details will be posted as I find them out. I just found out some great news. 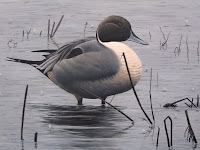 Alaska Ducks Unlimited has selected Rainy Day Respite-Pintail (pictured) as their 2008-2009 Sponsor Print of the Year. Funds generated from the Sponsor program will be used to benefit wetlands programs throughout the country. 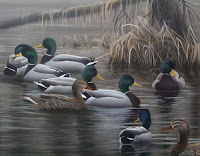 I have worked with Ducks Unlimited in Oregon, California, Michigan, Idaho and nationally. I am excited to be working with Alaska for the first time! What a day! I didn't figure to get much painting in because of the crazy schedule that started with a morning fishing trip with my kids to a local lake. Several bluegill and a couple of hours later I found myself coaching their first ever T-ball game which was hilarious! I once heard someone say that if you ever need to be cheered up, watch kids play t-ball. Right after the game it was off to the opening of Nature in Miniature in Salem. The show was very inspiring with close to 80 miniature paintings so, of coarse, I had to come home and paint. The one I worked on is picture here. It is still in progress and has a ways to go but I thought I would share it.